Last year this blog poured scorn on the siting of the four cycle stands (a generous allocation indeed) at Queens Road station, Walthamstow. I am delighted to say that Network Rail has responded to my criticism and moved all four stands to a new position. The improvement is, I think you will agree, remarkable. Well done! (Below) This stand is reserved for cyclists who are keen botanists. The photograph above shows the road closure with cycle lane access at the junction of Cairo Road E17 and Hoe Street, across the road from the derelict EMD cinema. Recently I was approaching it at 8.10 am in the morning when suddenly, to my surprise, a Smart Car came racing down Cairo Road and squeezed between the cast iron bollard on the left and the yellow and white illuminated plastic sign to its right. It happened too fast for me to get out my camera and take a photograph. The driver, an unaccompanied black male, turned left on to Hoe Street. When I caught up with him he was, naturally, occupying the cyclist's Advanced Stop Line at red. The driver was presumably too impatient to queue at the lights on Church Hill, where, because the traffic signal phasing favours traffic on Hoe Street (A112), vehicles often back up to the junction with the other end of Cairo Road. This sort of thing could easily be prevented with just one extra cast iron bollard. (Below) The plastic illuminated sign at this road closure is regularly struck by vehicles. Here it is at the end of June. Within days the Council had re-sited it with some tarmac patching at the base. And within days it had been hit and dislodged again. There are more and more people cycling in Vancouver. Public money is being wasted on these people, who are little better than welfare scroungers. Also they hold up cars. Something should be done. Enough is enough. It’s high time cyclists enjoyed the full rights of the road – including the right to obtain a licence, buy plates and insurance, and be subject to more frequent traffic violation tickets. The template for regulating cyclists is already in place. Commercial cyclists, such as couriers, must pass a written test and purchase a licence plate. R687 AKW White van man (white), chatting on handheld mobile phone while passing site of recent road crash fatality, Forest Road London E17, 12.50, Friday, 3 July. Making the pavement a free car park on Higham Hill Road E17. Apart from degrading the walking environment this also promotes speeding on a long straight road, making it unpleasant to cycle along. Well worth reading is the London Assembly Transport Committee’s response this month to the Mayor’s Transport Strategy: Statement of Intent. Our response to Way to Go questioned whether the major schemes so far proposed - cycle superhighways, Legible London and the cycle hire scheme – would be enough to achieve the significant increases in walking and cycling to which the Mayor aspires. The Committee’s scepticism is entirely justified. Cycle superhighways have all the appearance of being nothing more than crap cycle lanes painted blue. I find it hard to get excited about superhighways when something as rudimentary as Advanced Stop Lines are both poorly maintained and massively abused by London drivers. If the GLA, the Mayor and Transport for London can’t even organise enforcement of ASLs, what hope is there? The attitude of London drivers to cyclists and cycling facilities is a major block to getting more cyclists on the roads, but this is something nobody wants to talk about, apart from Jenny Jones. many people are put off by inconsistent signage and confusion about distances between areas. Now it’s true that signing for pedestrians in London is inadequate and laughable. But I don’t think that’s the real reason why people don’t walk. It’s because pedestrians are treated as an inferior species to drivers. They have to wait long periods of times to cross the road at green. Motor vehicle traffic flow is the number one priority. The 4X4 driver who chooses to drive into the West End enjoys a more privileged status as a road user than a pedestrian. And beyond such matters, pedestrians are diverted and penned behind by railings like cattle. Or they are sent down desolate, neglected subways (that grotesque labyrinth at Marble Arch, for example). They have to scamper across lanes of traffic where drivers are often breaking the speed limit or chatting on mobile phones. Where facilities do exist for pedestrians they are, just as they are for cyclists, all too often obstructed by selfish drivers. Drivers routinely park across pedestrian crossings when the green light is on for walkers; there are no road markings to deter them and no will to make this an enforceable offence. Pavements are cluttered with random and anarchic clusters of street furniture. Businesses unlawfully block the footway with signs and local authorities everywhere turn a blind eye. These are all problems which have been identified on numerous occasions in the past. The Livingstone mayoralty came up with regular documents about promoting walking. They were perfectly worthy and entirely toothless. They foundered on the resistance which is always to be found at a local authority level, from Councillors - especially Conservative ones - and/or highway engineers and planners, who are predominantly able-bodied men with car allowances and free work parking. TfL concluded in 2007 that 70 per cent of the potential increase in cycling would occur outside central London, as well as 80 per cent of the potential increase in walking. The current proposals for cycle superhighways into central London and the central London cycle hire scheme will not reach the bulk of potential new cyclists, which the Mayor will need to encourage if he is to achieve his aspiration of a 400 per cent increase. Even if they did, I don’t think it would make a blind bit of difference. Cycling and walking are going nowhere in an outer London borough like Waltham Forest. There is certainly some evidence of stagnation when it comes to cycling in outer London. Here are three sites in London where cycling has NOT doubled since 1997. These are counts taken by the London Borough of Waltham Forest over a twelve-hour period, 7 am – 7 pm. The counts in 1998 and 2002 were made in October, those for 2006 and 2007 were made in July. The reason why cycling has not risen on these routes is, I suspect, the issue of personal safety. On the road you encounter high volumes of traffic and reckless drivers; off-road you all too often encounter a lonely, glass-strewn neglected environment. The situation for pedestrians is no better. Year after year the Council turns over more and more pavements to legalised pavement parking, purely in order to accommodate the well-heeled minority who require on-street parking for their bigger vehicle (People Carrier or 4X4) or that third or fourth car. Even the pedestrian’s last refuge, the pavement, is stolen on behalf of car-dependent households. The streets of London favour the multiple car owning household, not the car-free household. Over 20 per cent of journeys are made on foot and £34 million is to be spent on initiatives addressing the needs and safety of pedestrians in the three years to 2011/12. It sounds an impressive figure but the reality is that pedestrians do not enjoy even a statutory legal minimum footway width. Waltham Forest council, like all others in London, flouts recommended minimum widths for pedestrians in order to accommodate on-pavement car parking. For walking in particular, there is a need for new ideas and innovations for beyond 2012 to ensure London becomes an increasingly pedestrian-friendly city. Well the Committee should take a look at the history of the 1985 footway parking ban. That was a very progressive piece of legislation. Its main enemy was local authority highway engineering departments, who cynically exploited a loophole to use it not to halt pavement parking but to create it. The 1985 ban failed to establish a mandatory minimum footway width for pedestrians, while at the same time allowing councils to introduce footway parking on what was vaguely defined as “narrow streets”. This was used to sabotage the ban, and footway parking in Greater London has rocketed since 1985, except now it is legal. Reclaiming those pavements for pedestrians would involve telling many car-owning households that they cannot park in their own street. I can't see that happening, can you? Alongside schemes to provide new capacity, we believe London’s growth will mean measures to influence travel behaviour will become inevitable. The potential scale of benefits and efficiencies to be gained from pricing schemes makes them look potentially attractive. However, there are obvious political barriers to their introduction, not least as there could be public opposition to such a proposal. Well exactly. Car owning households are now in the majority. And though Boris Johnson may contain some interesting contradictions as a politician, at the end of the day he is the friend of the motorist, not the pedestrian or cyclist. But even if Ken Livingstone had been re-elected, I still think London would be going backwards, not forwards. The problems begin at a local level; the current Mayor simply replicates them. The London Sustainable Development Commission’s London’s Quality of Life Indicators 2008-2009 report (of which more soon) has some interesting revelations, which underline how, transport-wise, London is going backwards, not forwards. Travel to school - a reduction from 50% to 44% in the number of children walking to school and an increase in the number travelling by car. Traffic volumes in London increased between 2002 and 2006. That occurred under Ken, not Boris. (Above) Who'd want to walk here? Footpath to Walthamstow High Street from South Grove E17. At least seven cyclists have been killed on British roads over the past five days. This is the latest reported fatality. A CYCLIST has died following a collision with a car in part of Derby last night. The accident happened in Boulton Lane, Alvaston, at about 7.40pm. The cyclist, who was travelling between Oak Drive and St Mary's Close, collided with a silver Mercedes car. Or could it just possibly be the case that the driver of the silver Mercedes collided with the cyclist? Sobs the caption in today’s Daily Telegraph. Shouldn’t that read: epidemic of bad drivers hitting the vehicle in front? Whiplash injury alone represents around £66 for every car insurance policy sold. The average quoted premium for third party, fire and theft insurance - typically bought by young and inexperienced drivers - rose by 4.6 per cent in the past three months to £968.22. Yet another left-turning lorry/cyclist fatality? From this photograph it looks as if it might well have been. 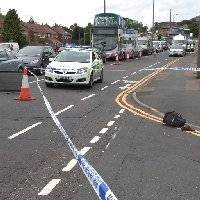 A female cyclist has died after a truck smash on Stanningley Road at Bramley. The collision happened at around 10.30am on Tuesday, July 28. The 27-year-old pedal cyclist was hit by a red DAF wagon and suffered serious injuries, police said. A 59-year-old man has been arrested for failing to stop at the scene. A 64-year old cyclist was killed yesterday while crossing the A30 near Hayle after a collision involving three cars. The driver of one of the cars, a German national, was arrested for causing death by dangerous driving and released on police bail until August 31. "This puts to rest the theory that arm swinging is a vestigial relic from our quadrupedal ancestors." Notice how this 'official' version of events fails to point out the obvious fact that the motorbike must have hit the bicycle. The yellow line on the right marks the centre of the cycle lane, probably no more than one metre wide, which at this point consists of a large water-filled pothole and gravel scattered for several yards. This is on Selborne Road E17, approaching Hoe Street, just after the entrance/exit to Walthamstow bus station, yesterday. The road here is narrow; larger vehicles such as buses can't avoid going into the pothole and splattering the pavement. So give the Council a prize! 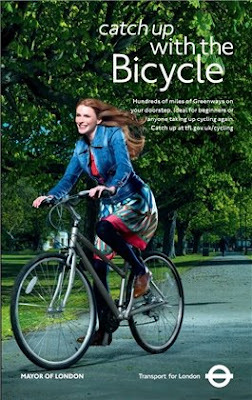 Waltham Forest was declared the winner for its innovative and extensive cycling facilities, which includes [sic] a 40-mile network of cycle lanes and quiet routes in the Borough. The Council regards cycling as an important mode of transport and almost all main roads in the borough now have cycle lanes. Gosh, and last week it was only 91 per cent! By Wednesday next week I wouldn’t be at all surprised if it had jumped to 123%. It's nice to see that TfL (and the CTC) now apply these statistics not to 'cycling in London' but to 'cycling on the capital's main roads'. Strictly speaking the statistics apply only to cycling on 40 selected London main roads. It is still unclear to me which roads are the chosen ones, how the count is taken (it is 'automated', whatever that means) or, more crucially, when the measurements are taken. Curiously, tucked away in the online archives of the Waltham Forest Cycling Campaign, I came across the revelation that the Council’s figures for cycling in Waltham Forest used to be based on a 12-hour count taken on a day in October. In 2006 they switched the count to the month of July. Which is a clever way of massaging the statistics, since it is undoubtedly the case that the warm weather and the long summer days of July bring out more people on their bikes than October, when the weather is likely to be poorer and it gets dark much earlier. Nice one, London Borough of Waltham Forest! Women have proved less enthusiastic about converting to two wheels. Research in February from Sustrans, the sustainable transport charity, revealed that four out of five women never cycle, and fewer than one in 10 cycle more than once a month. The study highlighted the perceived danger of roads as a primary concern, but Amy Fleuriot, whose women-specific Cyclodelic clothing range will launch in September, believes the problem goes deeper. "All the images you would see in the media were men clad in Lycra and going fast and that doesn't appeal to a lot of women," she says. "They think you have to buy all this specialist kit and you're going to get sweaty and that's not the case." The challenge for the government and bodies like the CTC will be to replicate the success of London in other British cities. Yes, we need more places in Britain to replicate the successful and friendly cycling environment of London local authorities such as the progressive, pro-cycling Borough of Waltham Forest. One incentive to non-cycling cities should be the statistics that indicate that, paradoxically, the more cyclists on the road the fewer accidents there will be. "At the very least, we should set an ambition to double cycling within the next 10 years," says Chris Peck of the CTC. What we really need, of course, are not targets, the glitter of statistics or expensive publicity campaigns urging people to cycle, but a massive transformation of the cycling infrastructure in conjunction with a serious effort to tackle bad driving and cyclists’ exposure to risk. As things stand I am not persuaded that any of this is going to happen. Just because the number of cyclists in London has increased greatly in recent years does not mean there are a host more ready to jump on their bikes. Indeed, the opposite may be the case. A decrease in London cycling? It’s possible I suppose. I used to know four people who’d given up cycling but now the total has risen to five. Someone who took up cycling a couple of years ago with great enthusiasm and who has now packed it in. Some days, after particularly bad experiences, I feel the same way. I had the realisation some years ago that no-one starts cycling merely because of statistics. In reality, apart from occasional blips, the rate of cycling in the UK has been in a long term decline for the last 50 years. Over those years, the conditions on the streets have become less and less pleasant for cycling. Even if it were true that safety came only from numbers, Britain simply can't achieve the numbers necessary to achieve that level of safety because the experience of cycling is simply too off-putting for the majority to take part. This is the obstructed fire exit to the right of the main entrance to Sainsbury's in Walthamstow High Street. Someone wrenched the railing off its wall mounting behind the vertical pole, dragged it to the right (you can see the mark on the brickwork), then gave up and left it wedged by the fire exit. Maybe it was just mindless vandalism. Or maybe they were trying to steal a bike and failed. Because there are only two cycle stands by the Sainsbury's entrance, it was common to see cyclists using this railing to lock their bikes. You would expect a firm like Sainsbury's to require the managers of their stores to have the fire exits checked on a daily basis. You would expect someone from the store to notice that the fire exit leading to the High Street was obstructed. But nobody did. For eight days. "I went to hospital for five hours and luckily there were no broken bones, but I was badly bruised on the arm and had whiplash. "My Merc is smashed up and I'm not in a good way." a traffic light-controlled cycle filter at the Blackhorse Road/Forest Road junction. This halts all other traffic, allowing eastbound cyclists 10 seconds to get ahead of the traffic or to turn right without having to weave across three lanes. Of course sometimes it’s not working! In which case you have a problem, as there is no Advanced Stop Line because you don't need one with this fabulous cycle filter! On the morning of the recent Green Fair, I cycled into Walthamstow from Tottenham along the A503 - which should surely be renamed Boris Johnson Boulevard. And this (above) is what I encountered. The cycle filter had been switched off. Needless to say, there was absolutely no advance warning for cyclists. You only find out when you get there, by which time you are to the left of three lanes of traffic, with the lane nearest a left-turn-only lane. And I was going straight ahead. The absence of any advance warning for cyclists, and the absolute indifference to the fate of any cyclist who is then stranded beside a lane of left-turning traffic, once again underlines the reality that cyclists are regarded as an unimportant species of road user, whose safety and convenience are of no real consequence to anyone. An hour spent gardening is more likely to result in injury than the same time spent cycling. That’s right, Chris. I could so easily trip over a daisy and break my leg. Every time I pull up weeds I might fall backwards and seriously hurt myself. In the garden I am also particularly at risk of being hit by a falling meteorite. Whereas when I cycle around the London Borough of Waltham Forest all those drivers who cut me up, overtake me with a quarter of an inch to spare, overtake and then turn left, or come round corners on my side of the road while chatting on mobile phones, obviously only exist in my fevered imagination. cycling in the city is 2.9 times safer than it was previously. Two near-fatal accidents in a week. he was still shaken after a black-cab driver had almost killed him as he was cycling to Channel 4. Six days later, the most influential green thinker of his generation – a man who as one-time director of Friends of the Earth has advised everyone from Prince Charles to Tony Blair – was hobbling around on crutches; this time, the result of falling off his bike after swerving to avoid a Mercedes' door opened in his path. This just isn’t credible, is it? Every London cyclist knows that black cab drivers are among the most considerate and careful drivers on the city’s streets. The same goes for drivers of Mercedes (a firm which has always had celebrity endorsement). Shame on you, Mr Porritt, for trying to insinuate that the streets of London are very risky places for cycling. It happens every weekend of course. Dangerous driving involving reckless risk taking, excessive speeding or inattention resulting from the driver's concentration on something other than driving is very often the cause. But the human factor is always sanitised by the term ‘accident’, implying that there is nothing anyone can do. It’s like a rainy day, just one of those things. These violent deaths are never connected. They are compartmentalised, and many of them never make it beyond the local paper. The connection with cars designed to flout the speed limit twice over, or the massive drop in road traffic policing, or the way the judicial system treats the right to drive as a basic human right, are never discussed. It’s always been this way. Six people died violent deaths on Scotland’s roads in a 12-hour period. In Kent two pedestrians were run down, one has died. In East London the driver of a BMW drove into a house, two dead. Three people died in Lancashire. That’s probably far from being the complete total. If terrorists or youths with knives had killed this many people in a single weekend, this would be a massive news story. Instead, it's business as usual. A cyclist has died after a road accident in Gloucester. Police are appealing for witnesses following the collision which took place at around 11pm in Trier Way on Saturday. A silver Vauxhall Vectra Estate, driven by a man from Gloucester, collided with a bicycle, being ridden by a man in his mid-thirties from Gloucester. A 15-year-old cyclist has died after he was involved in a traffic accident. Darryl John Manchett, of Manor Close, Witchford, died at Addenbrooke’s Hosptal yesterday after he was injured in a collision with a black Hyundai Getz on Church Road, Wentworth, near Ely, on Saturday night. The car’s driver and passenger were uninjured in the crash, which took place at about 9pm. 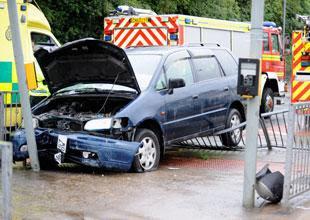 Police are appealing for information following a fatal road traffic collision in Frome on Saturday 25th July 2009. A black Suzuki motorcycle and a black Trek pedal cycle collided just prior to the roundabout at the junction. 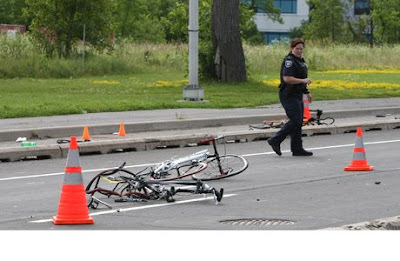 The cyclist, a 57 year old man, was taken to the Royal United Hospital where he was pronounced dead. A CYCLIST has died in a collision with a pedestrian near Boscombe Pier. Mr Watts was cycling down the steep Sea Road when the collision occurred at the roundabout where Sea Road meets the prom at around 9.30am on Saturday. He was taken to Royal Bournemouth Hospital with serious injuries and died at 8.40pm. Two women killed as they crossed a road on Sunday lunchtime were a mother and daughter. POLICE are appealing for witnesses after a Canadian tourist was was hit by a taxi crossing Waterloo Bridge. 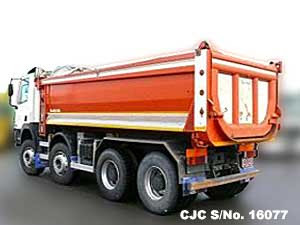 The collision happened on 28 June. So why have the Met waited a month before asking for witnesses? Concerned about the threat which the disintegrating canopy of the EMD cinema on Hoe Street might pose to cyclists, this driver has stopped here and done his best to make sure cyclists pull out and avoid the danger zone. Thanks! Olympic gold medalist and explorer James Cracknell is backing the groundbreaking Prostrate Cancer Charity tour rides in Stoke-on-Trent and London in September. You will get the chance to ride some if not all of the to final stages of the Tour of Britain. Cracknell says: ''Raising money and challenging yourself at the same time is the perfect combination, which is why I've decided to support The Prostate Cancer Charity's Tour Ride this year. And James knows all about how to raise money by promoting cycling! What fee was charged by James Cracknell for his recent appearance in Trafalgar Square? James Cracknell joined me at a cycling media launch and, as he shares my passion for cycling and is a member of the LOCOG 2012 team, I understand that TfL paid a much reduced fee of £2000. James’ involvement helped secure widespread coverage across TV, radio, online, and print media to help spread the word about the huge benefits of cycling. Two thousand smackers for standing next to Boris in Trafalgar Square and grinning at the photographers. Nice work if you can get it. And after all, it would be a pity to waste money like that on cycle stands, which are in laughably short supply around Trafalgar Square. Naz Sarkar is a councillor for Hoe Street ward in Walthamstow, and he is passionate about the interests of the people of, er, Reading West. For Naz Sarkar it was third time lucky in his zeal to become a Labour parliamentary candidate. The last time round he was criticised for his promotional election video, which appeared to suggest he lived in south London when he in fact lives in Leytonstone. And now this. It is being widely circulated among Tory bloggers. Well, you don't have to be a Tory to enjoy it. one of the most embarrassing political interviews I've ever heard. Personable though he may be Naz Sarkar is a wholly self interested careerist apparatchik as this appalling interview once again demonstrates. Warp-factor from 0 to 60 mph in 3.5 seconds and a top speed just shy of 200mph. Average fuel consumption is just 22 miles to the gallon, dropping to 15.4mpg around town..
A bit ironic in the light of this and this. (Above) The Transport for London fantasy cyclist. (Below) And here's what awaits her if she goes shopping in Walthamstow High Street. Cycle stand, corner of High Street and Vernon Road E17, yesterday. Villiers Street is blocked off to traffic at the junction with The Strand. There's the occasional cyclist who rides this way from The Strand to access York Place and the handful of quiet backstreets between The Strand and the Embankment. Some, who are perhaps worldly-wise, put both legs on the same side of the crossbar and balance on one pedal and scoot. Maybe in law this doesn't count as cycling. Recently I saw a twenty-something woman get nabbed by a WPC and PCSO for cycling on the paved section. She got a fixed penalty ticket (presumably £30). She was breaking the law. There weren't a lot of pedestrians around and she'd been cycling slowly. Two things intrigued me about this. As far as I'm aware, no driver ever gets ticketed for entering at red any of the Advanced Stop Lines for cyclists around Trafalgar Square, an offence which is at epidemic proportions just round the corner. And, curiously, on Villiers Street you are allowed to drive a car or ride a motorbike on the paved pedestrian area - provided it is for access. The offending cyclist was about where the man in the suit with the brolly is in the pic below. 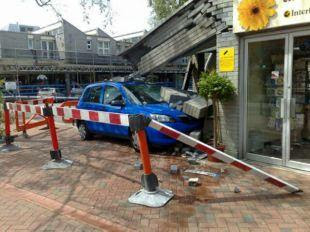 A CAR mounted a pavement, knocked down a pedestrian and ploughed into a Hampshire florist’s shop. The blue Mazda, driven by an 83-year-old woman, went out of control and ended up embedded in the front of The Flower Shop in Fryern Arcade, Chandler’s Ford, at 11.42am today. It’s a complete farce that the only person who has to verify that an 83-year-old is fit to drive is the 83-year-old. But the Brown government, like all governments, wants as many people as possible to drive cars and wouldn’t want to upset the motor trade. Oliver East, 20, appeared at Oxford Crown Court yesterday after admitting dangerous driving. East was charged after he knocked over Robert Bailey, 60, in St Aldate’s, in Oxford, on February 7. Judge Mowat said: “I am taking into account the evidence of fairly prolonged aggressive driving through an urban area, it was in dark and icy conditions, driving too fast for these conditions and overtaking. 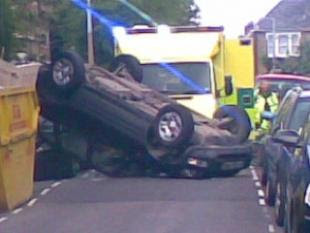 The driving was quite reckless at the time of the incident. Clearly the aggrieved suffered serious injuries. The mitigating factor is his early plea of guilty. After spending the last half a year researching and being very much involved in the Ghost Bike project as I create a book I have been moved by the unity within the cycling community not just on this forum but all over, while documenting and collating data I have decided to put across an idea. I believe we should have a date set in our diaries where everyone takes part in a memorial ride in Central London. The point of the ghost bikes is not just as a memorial to that specific cyclist but to serve as a reminder and a memorial to all cyclists who have died. I believe this is what the ride should do as well, not only serve as a time to reflect on the vulnerablility of cyclists but also hopefully raise awareness. This excellent idea will get no support whatsoever from the cycling-is-safer-than-you-think 'Always Look On The Bright Side Of Life' London Cycling Campaign. The U2 tour’s carbon footprint can be measured in space terms, with their colossal emissions of up to 65,000 tonnes of CO2 enough to fly Bono, the Edge, Adam Clayton and Larry Mullen Jr from earth to the planet Mars — and back. Martin Esom, the Council's Executive Director of Environment and Regeneration, is paid a whopping £115,133 a year. Councillor Bob Belam, cabinet member for Environment and Regeneration, enjoys annual allowances which come to £31,653.60. Who can doubt that this is money well spent if it gives residents the earthly paradise which we are privileged to enjoy, day after day, week after week, year after year? He’s ubiquitous. We must always be on the alert for Edmund King. He even turns up when you aren’t expecting him. Yesterday afternoon, for example. I set the video for LOST HORIZON on BBC2, a Hollywood blockbuster based on a bestselling novel written by James Hilton, who at the time was still living with his mum and dad in a semi-detached in what is now the glorious London Borough of Waltham Forest. Puzzlingly, having written two bestselling novels which were turned into Hollywood hits, James departed to spend the rest of his life in California. Quite why anyone would prefer California to Waltham Forest is one of life’s great mysteries. As I was running back the vid last night, there he was. Edmund King! At the tail end of the programme preceding the movie, something called ‘Working Lunch’. The discussion was about driving on the continent, and Edmund was there on the sofa to caution us about the vicious oppression which awaits the English driver from foreign police. Apparently they have on the spot fines over there, which can cause enormous distress to the hapless English motorist. Edmund painted a moving picture of an innocent English motorist who would never, ever dream of exceeding the drink-drive limit or the speed limit in Britain, but who, once in France, lets that intoxicating holiday spirit get to him. A couple of glasses of vino, you put your foot down, next thing there’s a big beefy gendarme glaring at you, demanding hundreds of euros. That sort of vicious police state nonsense can completely wreck your holiday. Abroad, it can get worse than that. The woman on the sofa was outraged at the “bizarre” rules that Johnny Foreigner has, deliberately designed to entrap your innocent English driver. Edmund King could not have agreed more. Dirty cars in Romania? How many people do you know who, when asked where they are going on holiday this summer, say, “We thought we’d go motoring in Romania”? But if anyone is thinking of relaxing this summer on the highways of Romania, beware - there are entire legions of savage, pitiless police waiting to swoop on a Brit with some splashes of mud on his Mondeo. Whereas in Britain carrying a device designed to evade road traffic law and to encourage reckless and lawless speeding is regarded with amused tolerance. The message was clear. The British driver can flout road traffic law to his heart’s content in this country, but once the other side of the Channel you’d better watch out. In Britain you don’t even have to bother turning up in court, and if you are rich you can hire ‘Mr Loophole’ to get you off a speeding rap. But abroad you might well encounter a mean, unsympathetic cop who wants to take your euros off you. Immediately, then and there, with no excuses. The prog ended with some free advertising for the RAC and the AA. That’s what the BBC is all about – what we philosophers call the Jeremy Clarkson Weltanschauung. the key to a long and healthy life? – well read it here. A MAN was taken to hospital yesterday after his car crashed into a pedestrian crossing on a busy Newport road. The London Borough of Waltham Forest doesn’t have a single cinema. The last cinema in the borough, the historic EMD shut in 2001, and fell into the hands of a very wealthy Brazilian evangelical sect, who want to turn it into a church. There is a local campaign to return this derelict building to its glory days. Having been refused planning permission, and having lost an appeal, the church has allowed the building to deteriorate. The shockingly neglected condition of the building is obvious to anyone who passes it. And yesterday morning (or during the night) a section of the porch overhanging the pavement collapsed. Presumably no one was passing at the time, as the collapsed section, made of solid wood, would probably have killed anyone it had hit on the head. It has roughly the dimensions of a railway sleeper, but is longer. It is also studded with nails. I think the Council should take urgent action to ensure that the frontage of this decayed building is safe. Just looking at it, it’s not hard to believe that more chunks of it might come crashing down onto anyone unluckily enough to be passing at the time. And isn't there some legislation which could be invoked against the owner of a listed building who allows it to deteriorate to such a shocking extent that it becomes a health and safety hazard to the public? So, just why is this person parking in the Town Square on a Wednesday afternoon, returning to his car, and driving off through the pedestrian zone? A black male accompanied by a white woman. Registration number L009 FHR. I find it hard to believe that this is anything other than someone dodging paying for parking, or someone so car dependent that they are determined to walk as little distance as possible from their parked car. It seems unlikely that this is an authorised user, as the easiest way out from where the car was parked is nearby Selborne Road, and the bollards here are unlocked and removed for those who are deemed to be on official business which requires vehicle access. The reality is that drivers are still free to opt for free parking in the Town Square because this crap Council still hasn't blocked off access via the High Street (two of the bollards are missing by the library cycle stands) or - if you have the nerve - via the bus station, or (for larger vehicles with clearance underneath) Selborne Road, where one of the new bollards has already been hit and 80 per cent flattened. If you have any thoughts on the matter, why not pass them on to the boss. Incidentally, look at those children in the foreground (below), who are paying no attention at all to passing traffic. And I can't see a single pedestrian wearing the recommended high visibility yellow clothing. As any Crown Prosecution Service lawyer will tell you, pedestrians and cyclists are very hard for drivers to see at the best of times. The extent of the contributory negligence on display here is shocking. So there I was, sauntering along Tavistock Place WC1 at 10.35 am yesterday. I was heading west and about to cross at the junction with Herbrand Street, when I was cut up by two black cab drivers. They were travelling east and turning right off Tavistock Place into Herbrand Street. They should have waited for a pedestrian who was about to cross, but black cab drivers (many of them) are as contemptuous of pedestrians as they are of cyclists. I managed to jot down the number of the second cab driver: 30179. He should be taken off the roads until he learns how to drive. I don’t doubt this yob is as contemptuous of cyclists as he is of pedestrians. A couple of minutes later I reach the junction with Bedford Way. The male driver of M888 BOW turned into it from Tavistock Place, chatting on a handheld mobile phone. A little later, I return on foot along Tavistock Place, at 11 a.m. There’s a DHL driver, a white male, at the wheel of a yellow LGV. He’s steering with one hand while holding a London A-Z in the other, which he’s looking at. Reg. FJ55 KUG. This reckless driver made me think of how Emma Foa died. The moral is that Greater London is crammed with dangerous drivers, whose reckless risk-taking constantly threatens the lives of cyclists and pedestrians. They are very easy to identify and could very easily be taken off the roads. But there is no political will to do so, from either the Commissioner of the Metropolitan Police (“Working to perpetuate London's walkers' and cyclists' exposure to risk”) or the Mayor or the Greater London Assembly or the Government. The London Traffic Report 2007 shows that taxis carry just 2.9% of commuters on the roads in the morning peak and just 0.6% of all commuters in central London. Yet taxis are allowed to take up a huge and disproportionate amount of the road space, including being given access to the bus lanes. Why is this? That behaviour could be changed but there's no sign of any political will to do so. Every cycling blog I read contains anecdotal evidence of repeated bad experiences. And the letters pages of local newspapers supply regular stories of bellicose drivers who resent cyclists using the road. Here's my contribution to the anecdotal. There I was, yesterday afternoon, on the recommended London Cycle Network ‘Quiet route to Hackney’, going east, along Cranbrook Mews E17. Back in April 2008 I showed that the entry sign to this route had been twisted round but naturally no one involved in cycling in Waltham Forest gives a toss. Fifteen months later the sign is still twisted round in such a way as to make it unreadable. The blatant neglect of cycle signing is itself a small, eloquent symbol of how little importance Waltham Forest council really attaches to cycling. As I pedalled along Cranbrook Mews I spotted this ahead of me. A shattered manhole cover. Just beyond it there was this (below). A pile of sand and gravel, which has spilled out across the carriageway. It has been here so long that grass is growing on it. But no one from Waltham Forest council, and none of the three High Street councillors has noticed. This is a narrow two-way route which cyclists have to share with double-decker buses accessing a bus terminus and commercial vehicles servicing back entrances to High Street stores. And then I reached the junction of Cranbrook Mews with South Grove. I didn’t bother to photograph the ASL, occupied, as usual, by a motorist. Thousands of offences are committed at this junction in all three ASLs every day, to the total indifference of Waltham Forest’s police commander Mark Benbow. The Met’s statistics on crime are worthless because they omit unrecorded crime, and no one is interested in recording the stupefying number of crimes committed day after day across Greater London by the capital's most anti-social, lawless and violent group, i.e. drivers. The Met is institutionally car supremacist and signally failing in its duty of care to vulnerable road users such as cyclists and pedestrians. No surprise, when the Met’s new Commissioner Paul Stephenson is identified as one of the good guys in the Association of British Drivers’ inventory of good cops/bad cops (go to ‘Quotes on speed cameras’ here). This is just one small aspect of a much wider problem. The lights turned to green, and I let the flow of cars on South Grove pass, before slotting in behind the last of them, Y40 LEG, white male driver chatting into a handheld mobile phone. He turned left in front of me into Willow Walk without signalling. I continued straight on, towards Selborne Road. Two car drivers turning right on to Willow Walk from Selborne Road drove across in front of me, cutting me up. I then narrowly avoided a collision with a third driver who was following the first two in the sheep-like fashion of drivers. He slammed on his brakes and I braked too, then wobbled on. I suppose I should have a helmet cam for this kind of experience but I feel that way madness lies. I’d be spending too much time downloading footage to YouTube. Just beyond the junction I spotted the black male driver of this HGV reg. MX07 AHN, chatting on a handheld mobile as he drove down Selborne Road. So I stopped and took this pic from the rear. And notice incidentally how close that approaching car (a Mercedes, I think) is to the cycle lane. Further evidence for the argument that cycle lanes which fall below the recommended two metres width encourage drivers to come closer to cyclists than they would do if there was no lane there. I’d like to live in a civilised society where men like the car and HGV drivers on their mobile phones immediately lost their licences. 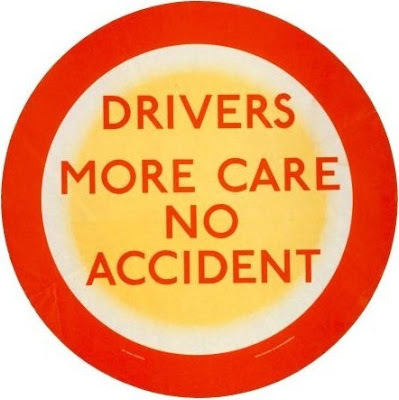 But the Brown government is far more concerned with ingratiating itself with the mobile phone industry, the road haulage industry and the car lobby, than it is with the safety of vulnerable road users. Even if those drivers were caught they would only get 3 penalty points and a £60 fine. A lethally dangerous activity is regarded with indulgence by the government, and there's no reason to believe things will change under a Cameron government. The amount of time which elapsed between me encountering two surface hazards on a poorly maintained section of the London Cycle Network, drivers entering ASLs at red, a car driver using a handheld mobile phone, two drivers cutting me up and a third narrowly avoiding hitting me, and an HGV driver using a handheld mobile, was about three minutes, at around 3.50 pm. 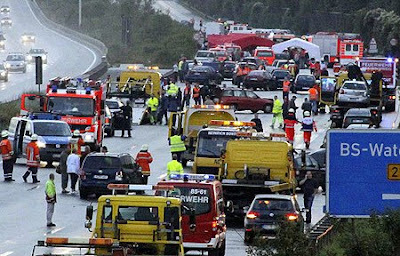 More than 259 vehicles were involved in a huge pile-up on one of Germany's main autobahns. More than 65 people were injured in the crash, including 10 who were still fighting for their lives yesterday. So once again, let's remember the man who made autobahns possible. Spot the difference (above and below). Walthamstow High Street. The blue fencing was put up "temporarily" six years ago. Lawful procedures were followed to fence off the footway. Naturally no consideration was given to pedestrians when new car parking bays were introduced alongside a then much-reduced footway, the width of which fell well below recommended minimum footway widths for pedestrians with a mobility handicap. No such procedures have been followed by the contractors currently employed by Waltham Forest council to clear and resurface the Arcade site. This green fencing constitutes unlawful obstruction of the public highway. This lawless obstruction on High Street wouldn't much matter if the Council had suspended the parking bays, but obviously that is out of the question - creating car parking opportunities is the number one Council priority and takes precedence every time over the safety and convenience of pedestrians (or for that matter cyclists). The Highways Authority has a duty to take action against unlawful closure of the public highway. But this would involve the Council taking action against its own contractors, so don't expect it to do anything at all. (Below) That's really brilliant, isn't it? This is the Council which is "positive about disabled people" - positively contemptuous of their mobility needs. A MAJOR campaign has been launched to educate tens of thousands of cyclists on how to avoid being crushed to death by left-turning HGVs on the streets of London. But what if the problem isn’t the cyclists but the lorry drivers? Most (all?) of the cyclists who have been killed by lorry drivers in London in the past year are not naïve novices but, as far as one can tell, highly experienced, cautious cyclists who are run down while cycling routes they use everyday. Where is the evidence that all those cyclists recently killed by left-turning lorry drivers wilfully undertook them? There is none, that I am aware of. So the whole thrust of this campaign is classic blaming the victim stuff. Six cyclists have died in collisions with lorries in the capital this year - five of them women. So, Kulveer Ranger, a senior figure at TfL, can’t even get the figures right. Seven cyclists have died this year, not six. Of course it’s hardly surprising that TfL can’t get the facts right when most news organisations don’t regard the regular killing of cyclists as in any way newsworthy. And the London Cycling Campaign (‘Always Look on the Bright Side of Life’) won’t mention them either, on the grounds that this might deter people from taking up cycling. The missing fatality is, of course, María Emma García Fernández, whose death failed to register on a single London or national news site and, bizarrely, was only recorded on this blog and two cycling discussion threads. A TfL study two years ago found that women are far more likely to be killed by a lorry because, unlike men, they tend to obey red lights and wait at junctions in the driver’s blind spot. Among those killed this year are Eilidh Cairns, 30, who died in a collision with a lorry at Notting Hill Gate in February. was completed last July (2006) but has been kept secret. Which makes it three years ago, not two. Kulveer’s not very good with figures, is he? Secondly, juxtaposing those last two sentences is very misleading, because Eilidh Cairns was not killed by a left-turning lorry. Eilidh was on the right hand side of the lorry that killed her. No witnesses have come forward so we don’t know what happened; it’s possible that the lorry moved out from the left and ran her over from behind. improving the relationship between cyclists and lorries. I never have a problem with inanimate objects. It’s lorry drivers who bother me. And there is a mountain of evidence to show that the road haulage industry is founded on widespread driver criminality, which both the government and the police turn a blind eye to. I am not interested in ‘improving my relationship’ with lorry drivers like this one or this one or this one or this one or this one or this one or this one or this one or this one or this one or this one. I would much rather see them prosecuted for breaking the law. We will do much more because changing London into a cycling city is about changing the way we feel about cycling. The Mayor’s cycle revolution will make taking to two wheels easier, more accessible and enjoyable. But most importantly it must make it even safer. Which is where road traffic law enforcement comes in. A subject which remains out of the frame for TfL but which has been authoritatively addressed here. Ingrid Tarrant is the classic arrogant slob driver who the system protects. She’s now been caught again but there’s nothing about a driving ban. And no journalist has connected this episode to her earlier offences. Ingrid Tarrant, 54, was said to have been "abrupt and rude" with the officer who tried to issue her with the ticket for leaving her silver Saab parked in a bus stop. She then drove off despite repeatedly being asked to stop. The officer followed her for two miles, eventually halted her, cuffed her and after a struggle forced her into the cage in the back of his police van, Staines Magistrates' Court in Surrey heard. Following a two-day trial Tarrant was convicted of four charges. She was ordered to pay a £2,700 fine and £1,200 costs for parking in a bus stop, failing to stop for police, obstructing a police officer and resisting arrest. So, apparently no driving ban. And the fine will mean nothing to an enormously wealthy woman like Tarrant. Police believe a minivan pulled into the bike lane on the northbound side of the road at 7:48 a.m. and collided with the riders before steering back into the vehicle lane. The cyclists are believed to have been riding in a relatively tight single-file formation in the bike lane, which is clearly marked. TWO men are believed to have escaped a serious car crash without suffering major injuries. Inspired by yesterday's Green Fair I decided to leave the 4X4 at home today and cycle into Walthamstow instead. And I was so pleased I did. Cycle parking is so much easier than driving around trying to find somewhere to park. And let's face it, cycling is "green" - just like these London Borough of Waltham Forest trade refuse sacks, seen here this morning beside the cycle stand on the corner of High Street and Vernon Road E17. Also at the Green Fair were Kier, who are responsible for the see-through sacks which can be identified here. They bear the message Kier Street Services and Waltham Forest Council - working together to keep Waltham Forest clean. With attractive and convenient facilities like this, I feel certain more and more drivers will be persuaded to give up the car and take up cycling. Waltham Forest cops in new crime triumph!